After more than a decade, a mysterious attachment to a certain book yields the sweetest fruit. Srila Prabhupada said that if someone just holds one of This books about Krishna and appreciates it, without even buying it, that is enough to ensure that person a human form or higher in the next life. The power of Srila Prabhupada’s books has touched and changed forever many thousands of lives, including my own. One morning in the glittering city of Mumbai, a small girl, barely seven years old, woke up without knowing that on that day she would make a journey she had been awaiting for many millions of lifetimes. That afternoon, in 1984, she held her grandfather’s hand and walked into the complex of a gorgeous temple. Under a beautiful clear sky, she beheld sprawling gardens and heard strange yet sweet-sounding chants. She walked around the gardens, holding her grandfather’s hand and looking curiously at every passerby. There were so many people-faces she had never seen before. Yet a sense of comfortable familiarity enveloped her. She walked into a large hall where numerous people sang and prayed to beautiful white marble deities. For a while she didn’t know whom she was staring at. Then someone told her it was Krishna. as afternoon turned to evening, some book-covered tables caught her eye, and she pleaded for one book in particular-Raja Vidya: The King of Knowledge. It was way beyond her intelligence, but the beautiful cover picture of two warriors blowing conch shells stole her heart. She held the book and wouldn’t let go till her grandfather paid the five rupees. From that moment, a deep attachment for the book began to grow in her. More than just a book, it was a person she would never let go of. She carried the book everywhere. Intuitively, she knew it had the power to protect her from all dangers and comfort her like no one else. at night, she hid it under her pillow and hugged it to sleep. When she was ten, as a Girl Guide (Girl Scout) she traveled alone to camps and on trips. Her special book was her solace on those lonely rides. Then came years of boarding schools. When she was sick, sad, or afraid, she held on to the book, her best friend. She hadn’t yet read it. Years went by, and now she was an out-of-control teenager. Between her studies and fantasies about the life that lay ahead, the only stable ground was Raja Vidya. By day it would stay on a makeshift altar, and at night it would lie in her arms as she slept. One day, as she randomly flipped through the book, she came across a story about Indra, the king of heaven, as a pig. When Lord Brahma, the engineer of the universe, arrived to rescue him, Indra refused to leave. Deluded, he was attached to his life as a pig. The book explained that each of us, in any condition of life, holds a deep attachment to the body and doesn’t want to give it up. That is illusion. The explanation made sense, but she didn’t know what to do with it. Something from within her heart inspired her to bow down to the book when waking up, going somewhere, or starting anything new. No one asked her to do it; rather, people mocked her. By now she had almost forgotten where she had got that book. Then one day, almost ten years after she’d received the book, she was sleeping in a train en route from Delhi to Pune when a noise woke her. It was 4:00 in the morning, and everyone was trying to sleep, but a sweet melody and loud drums and cymbals woke everyone up. People complained, but the girl was drawn to the singing and went up to the musicians, who were wearing strange clothes. They said they were devotees of Lord Krishna and awere singing what they called mangala-arati to remember the Lord. One of them invited her to visit their temple. Her mother soon pulled her away from the strange people and kept her under guard. a few more years passed by, and her attachment to the book reached new heights. Still, fool that she was, she had not read the book from cover to cover. She just held on to it. It had now become a storehouse of all her fondest memories-pictures of loved ones, her most precious letters, and tears from every time she was in need of help. In January 2001, she was running around to finish some last-minute shopping, as she was leaving for australia the next day, and she ran into a familiar face. She couldn’t place the man at first, but his strange clothes stood out. Memories flashed. There stood the person who four years earlier had awakened her on the train. She cooked up a quick excuse for not having ever visited the temple. She had an attraction for Lord Krishna, as they shared birthdays and her favorite book was about Krishna. The book Krishna cost 125 rupees, and although she had only 100 left, the kind gentleman gave her the book anyway. He also gave her the address of the Hare Krishna temple in Melbourne. She happily took it, but thought she would never visit a temple. She was on her own search for truth and felt she might find it in history or science or perhaps even some ancient mystic religion. But she wasn’t going to a temple- too much ritual. The next day she left for australia with lots of clothes and two books: Krishna and Raja Vidya. almost a year had gone by, and she had read a few stories from Krishna, totally unaware of the author, totally unaware that Raja Vidya and Krishna were written by the same author, and totally unaware of a mantra called the Hare Krishna maha-mantra and of the existence of ISKCON. She had successfully ventured into aboriginal cultures, read books on science and religion, explored Wicca, american Indian tribes, Christianity, pagan religions. She had tried everything and anything, but nothing satisfied her. One day, walking back from work on one of the busiest streets in downtown Melbourne, she heard cymbals and drums. She wondered for a moment whether the sound might be coming from an Indian festival or the arrival of a VIP . She was too preoccupied to stop and think, but before she could hop onto the streetcar, she saw a group of saffron-clad australians singing ancient tunes and playing cymbals and drums on the street. She stopped for a moment, and her eyes locked on to the face and smile of one of the women in the group. She was playing the cymbals and looked happier than the gods in heaven. She wondered who these people were but moved on. a few days later, on the same street, she saw the same group and the same woman. They looked at her as if they knew her-and she them-from another time and place. It was a Friday evening, and she decided to follow the group, trying to make sure no one else noticed. It would be too embarrassing if anyone found out she was following these strange people. She followed them into what they called a loft, and as she entered, a group of beautiful people were chanting Hare Krishna, Hare Krishna, Krishna Krishna, Hare Hare/ Hare Rama, Hare Rama, Rama Rama, Hare Hare. as she sang along, she broke into tears, not knowing who these people were and what this mantra was doing to her. She still had not yet made the connection between her two books, these people, and the mantra. Her life started to change. She visited the loft a few times a week and took a lot of notes. Everything these people said seemed so true. One day they invited her to visit their temple, and she readily agreed to go. She arrived at the temple on a Saturday morning, and it was empty. So she sat facing closed doors and admiring how clean and quiet the temple was, unlike anything she had seen. She wanted to pray, but didn’t know what to do. as a million goose bumps appeared on her body, she realized that Srila Prabhupadaa, by the power of his books, had dragged this spoiled brat to his presence and given her the tastiest, sweetest gift: the holy name of God. This was the story of my insignificant life. Srila Prabhupada’s books have deeply touched many thousands of people like me. That is their power. They are not ordinary books but transcendental gems from another world, a world not marked by birth, death, old age, and disease. The very presence of Prabhupada’s books in one’s life can draw one ever closer to the spiritual realm of eternity, knowledge, and bliss. 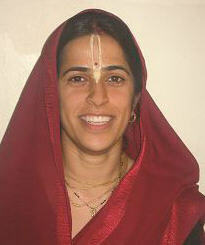 Maìgala arati Devi Dasi, a disciple of His Holiness Devamrta Swami, lives with her husband in Toronto, Canada, where she works for a bank as a project manager.